Horizontes isn’t just meant to reflect the people of north Wichita. It’s meant to celebrate them — to give them pride in their past and present. 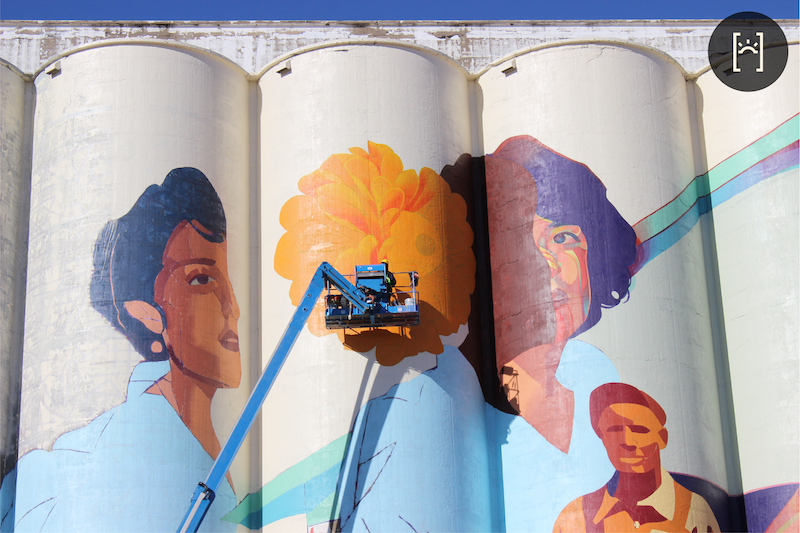 Armando Minjarez has wanted to paint a grain silo for a long time. 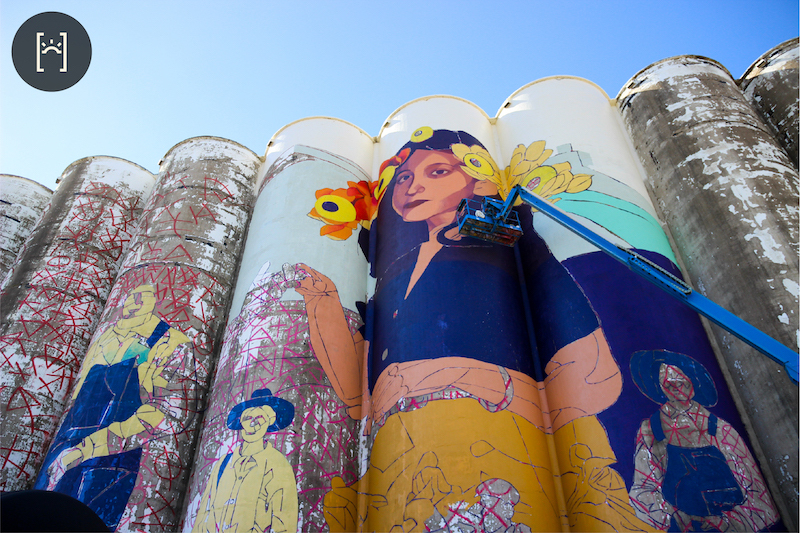 "I feel like any artist who paints murals, or paints in general, always looks at a grain silo as a giant canvas to paint," he says. "So I guess, for a long time, I’ve had that idea." 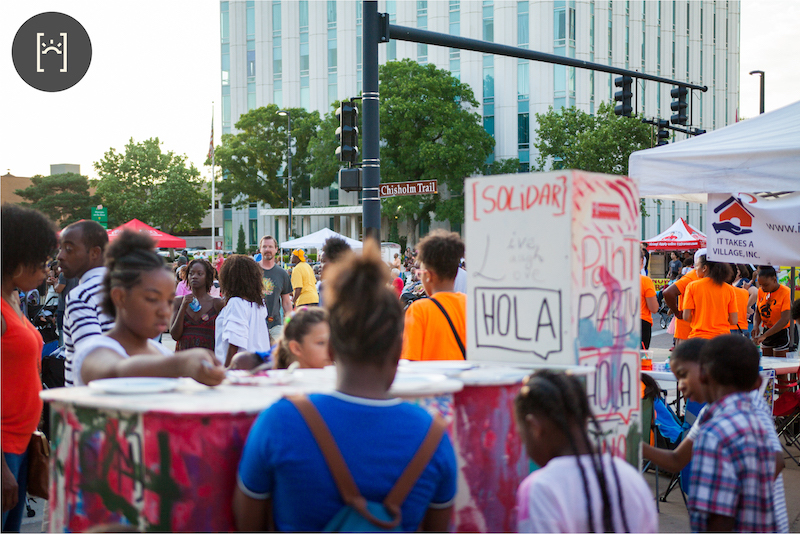 About five years ago, Minjarez began turning that idea into a reality through the Horizontes project, which aims to connect Wichita’s predominantly Latino North End and historically African American Northeast neighborhoods. In 2017, the project was one of 33 to be awarded a portion of $5 million in grant funding from the Knight Cities Challenge. More than 4,500 applicants sought funding. Minjarez says that, while Wichita as a whole has been progressing, new economic opportunities haven’t been extended to everyone — especially in north Wichita. He remembers driving through the area and seeing the giant, industrial concrete structures that divide its neighborhoods. He saw two little girls playing with nothing but gray on the horizon behind them. "That’s all I could really see behind them. That was on the horizon," he says. "These girls had no say-so in those structures being put there, so what if they weren’t there? What if they looked different? What if they were painted? What if there was a mural? What if there was something more inspiring to look at and not just this gray thing?" Minjarez didn’t just want to paint the horizon, though. He also wanted to get community perspectives on life in north Wichita and how the city could better engage residents in the future. Horizontes is a community engagement project as well as a beautification project. To be considered for the Knight Cities Challenge, Horizontes had to focus on at least one of three key drivers for city success: talent, opportunity or engagement. 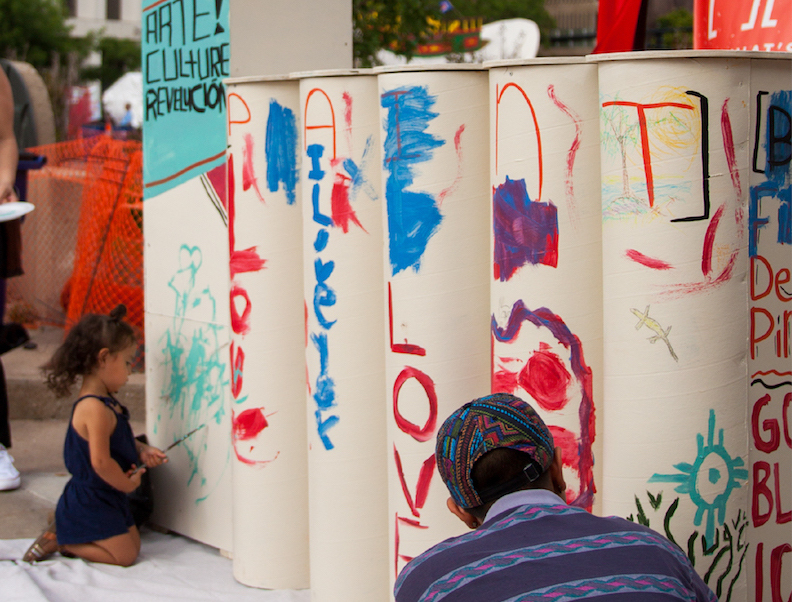 Horizontes touches on all three through art, community and celebration. 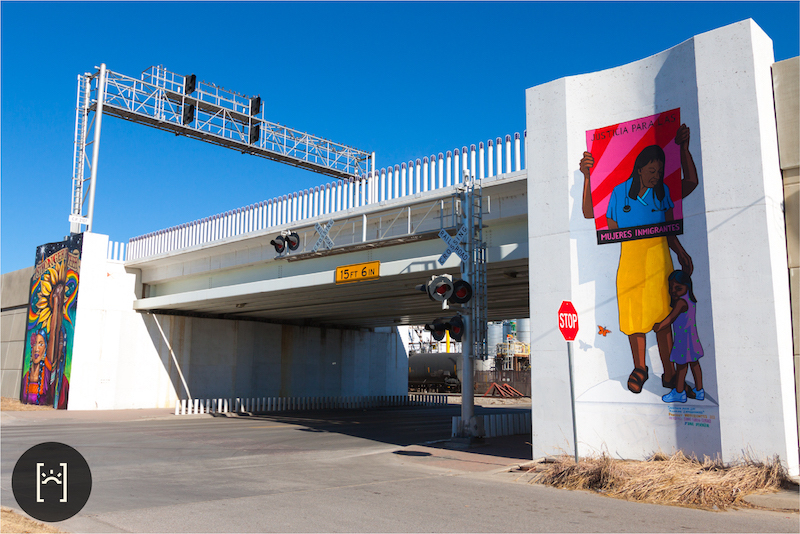 While the Horizontes project is much more than just the colors and shapes on the walls and buildings, the project’s art is what captures the attention of the city and draws us all to this common understanding of what north Wichita represents and needs. 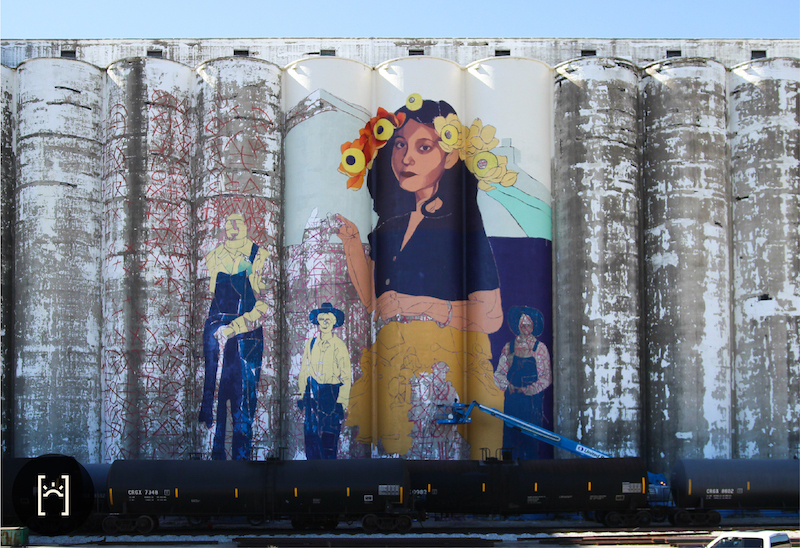 Renowned Columbian artist GLeo was commissioned to paint the large-scale mural on the grain elevator while local artists and volunteers helped complete smaller murals on the 13th Street bridge, Nomar Theater and the Historic Dunbar Theatre. 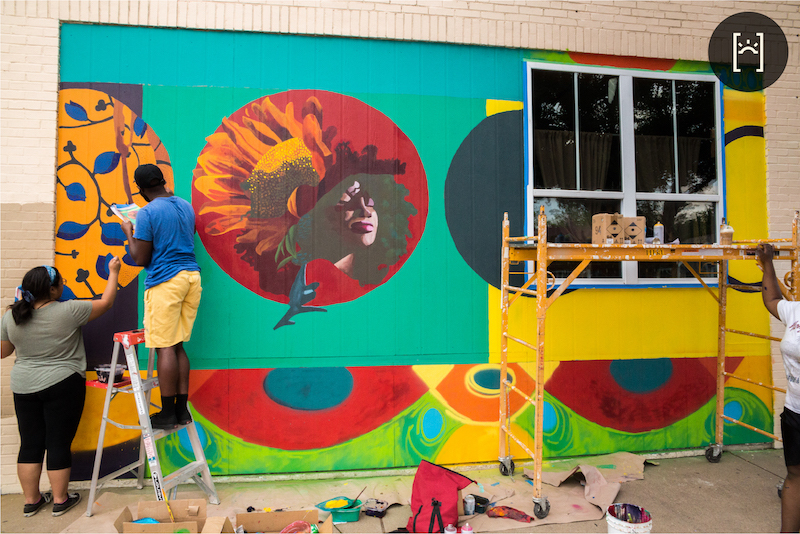 A summer mural jam also brought 11 more murals to the area. In all, Horizontes gave jobs to 52 people — 32 of whom were artists. 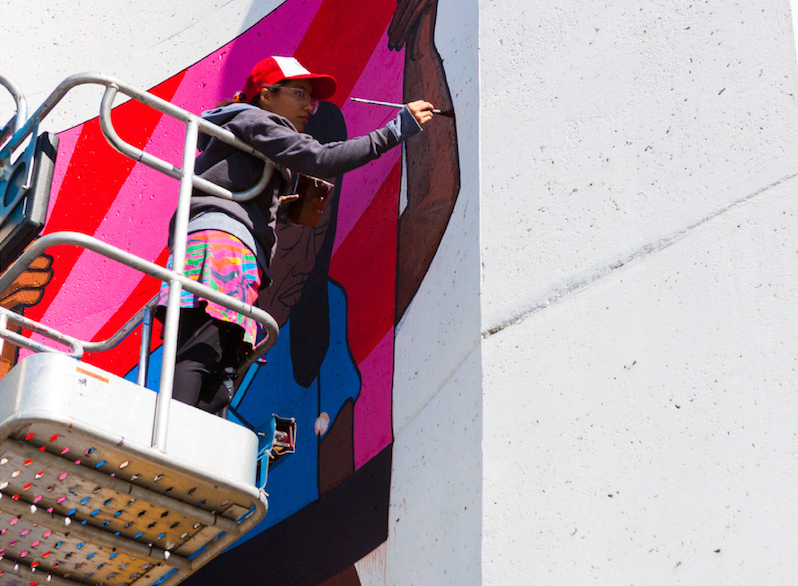 Of those artists, 27 are people of color, in some cases telling their own deeply personal stories on the walls of Wichita. All of the murals are impressive — colorful stories of immigration, heritage and hope. But it’s the massive grain silo mural that has everyone talking. The mural is under review to potentially earn the Guinness World Record for largest mural painted by a single artist. But Minjarez says that really wasn’t the point. "It’s not because we [were] trying to break a record, and it’s not because we’re trying to have so many murals on our list," he says. "It’s about what [the murals] are doing right now and what they’ll continue to do in the lives of the people who live around them." Kylie Brown, project facilitator and creative associate for the Horizontes project, says it’s important to keep the art in perspective of the project itself. While art can’t last forever, the change it sparks could. "It will fade, or the building structure will die," she says. "But if those conversations can get sparked, that will be the most beneficial result of all the art going up." The Beachner Grain Elevator is one of the largest in Wichita, and represents the industrial corridor that has divided north Wichita neighborhoods since the 1950s. The mural is made up of African-American and Latino characters painted completely by hand. The mural is one of the largest in the world painted by a single artist. 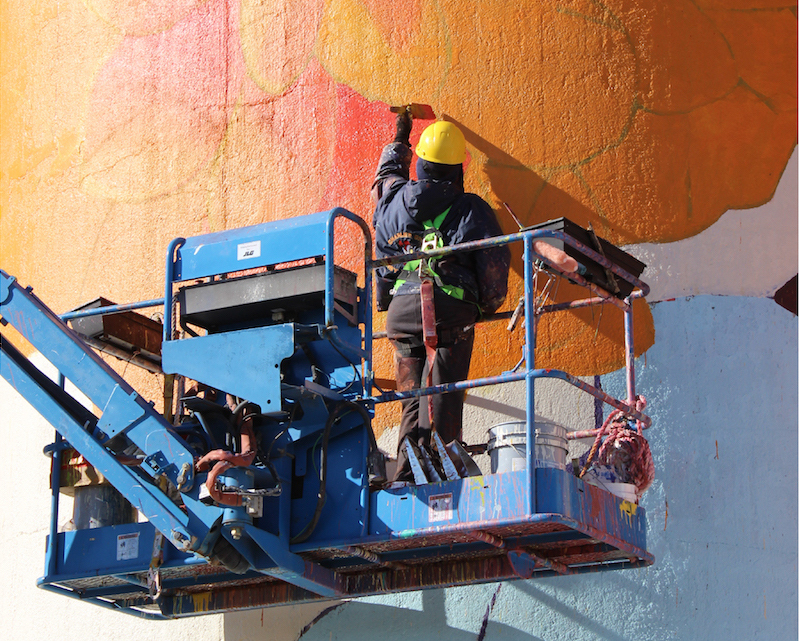 GLeo, a street artist born and raised in Columbia, was invited to Wichita to create the mural. 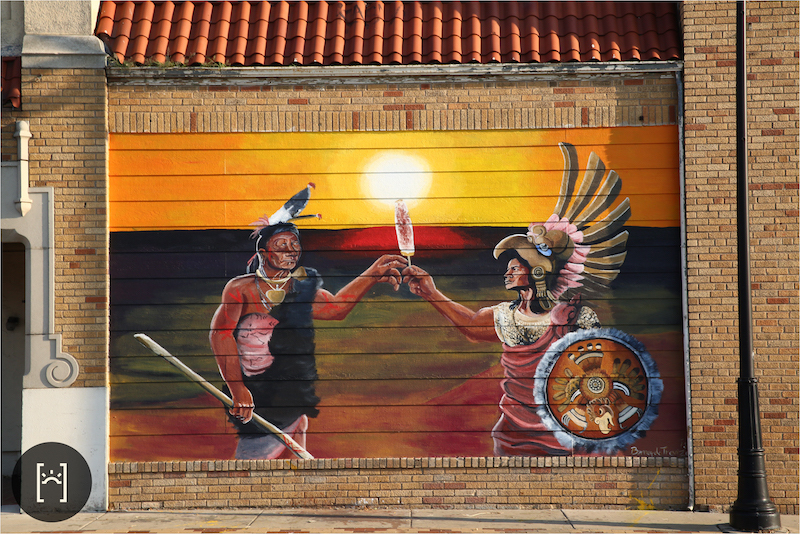 A mural at the Evergreen Park Recreation Center, painted by Columbian artists Ivan Salazar and Felipe Ortiz. Artists work on a mural at 2130 N Market. 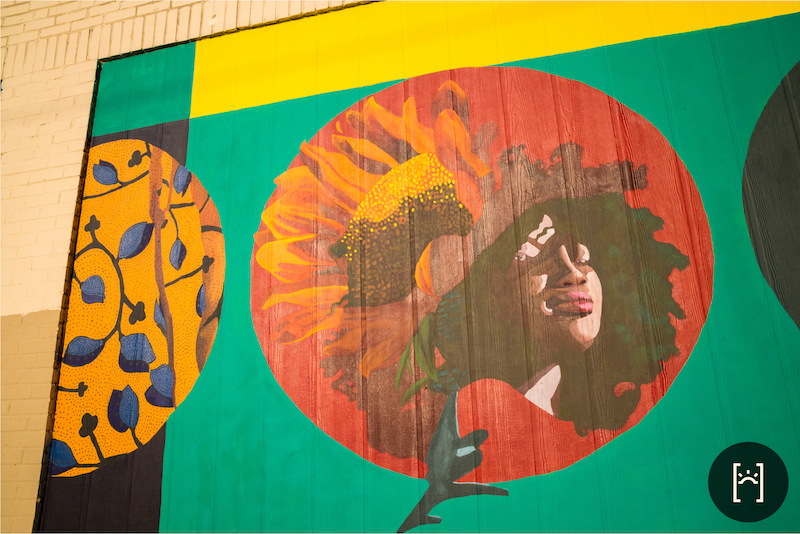 The mural was created by Wichita-based artist Alexis Rivierre. 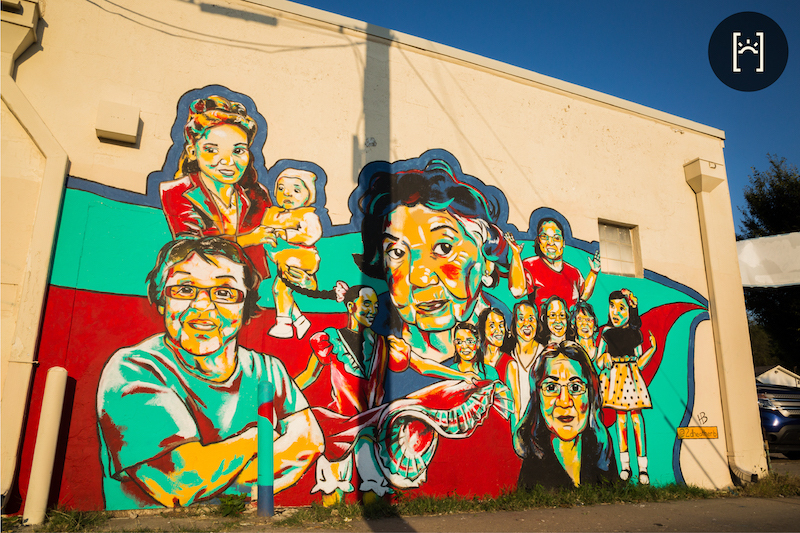 A mural at 100 E 21st Street depicts, painted by Wichita-based artist Heather Byers depicts the beautiful heritage of Latina women. “For this mural, I’ve pored through photos of the women in my family, specifically those with ties to the North End neighborhood,” she says. Lawrence, Kansas-based artist Connie Fiorella Fitzpatrick works on a mural on the southwest corner of the 13th Street train bridge. She immigrated to the United States from Lima, Peru, and is now a U.S. citizen. “We cannot neglect that we are simultaneously fighting to be seen as human, integral to society at large, unlike our white counterparts, who are able to fight for justice without having to show proof of their humanity,” Fitzpatrick says. 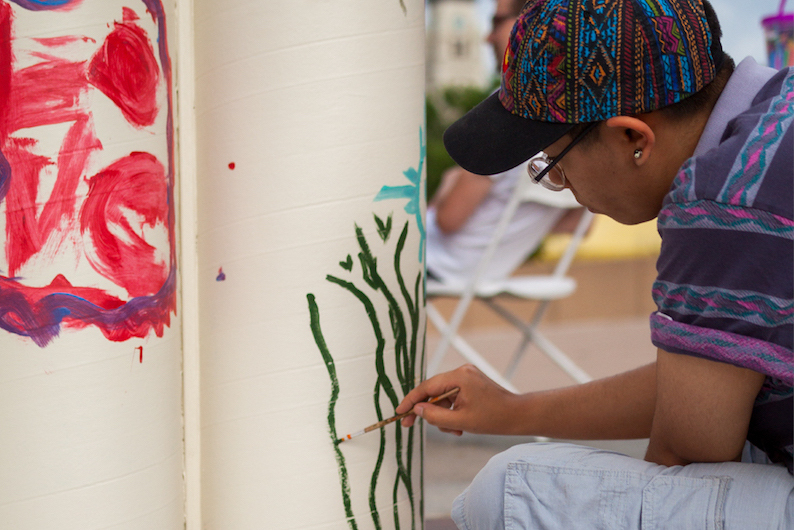 In addition to Horizontes being an art project, it’s also a community engagement project. Tadonne Neal was one of many tasked with canvassing the neighborhoods of north Wichita for the Horizontes project to get a sense of who lives there, what they believe about themselves and the community and to record their story for generations to come. "For me, it meant being able to engage with my own community," she says. "It feels like the project gave me common ground in my own area." Minjarez says a big goal for the project is giving Latino and African-American people living in north Wichita the chance to see themselves in a beautiful light. "I wanted black and brown people to be painted and depicted in the most magnificent way that you can imagine," he says. "The team that is making this happen, we’re immigrants. We’re Latino. We’re queer people. We’re women and all of those other different identities that often give us more barriers throughout life." Minjarez says he remembers a photograph that was posted on Facebook of a group of school children standing in front of the mural on the 13th Street bridge. "I think all of them were black kids, and they all just looked so happy and excited in front of this mural," he says. "This is why we need to do what we’re doing. Because these kids haven’t had many opportunities to be affirmed, to see themselves in a positive light, to see their own identities reflected outside of stereotypes, outside of gang bangers, or abandoned kids, or crazy moms or whatever stereotype it is that you see in a TV series or in a movie or in a magazine or in the news." Minjarez says the mural on 13th Street was particularly difficult to get approved. He says the neighborhood association felt the message of the mural was too political and aggressive. But he says it’s not about politics. It’s about the realities many immigrants and minorities face every day. "Our experiences immediately label us political," he says. "It’s simply my life experience. And that’s the kind of power shift that we can have with this type of work where we are providing a platform to give a voice to people who often don’t have a voice." 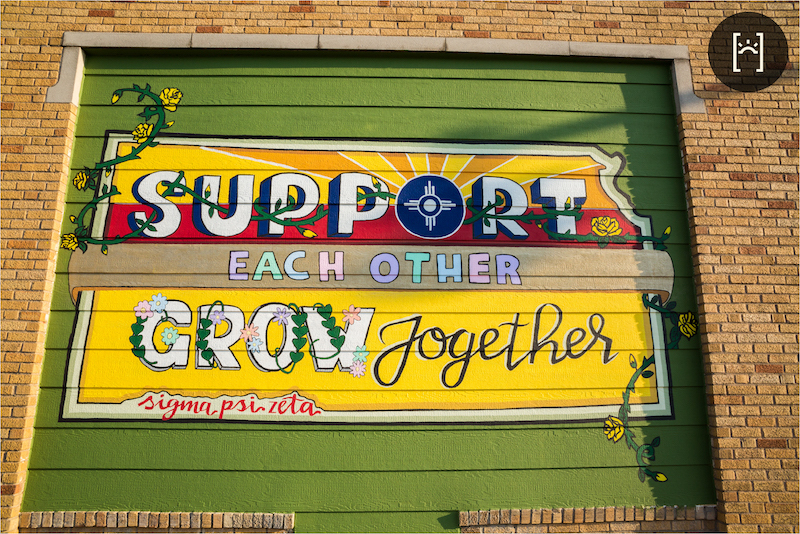 A mural at 130 E 21st Street, painted collectively by the Sigma Psi Zeta Greek multicultural organization at Wichita State University. 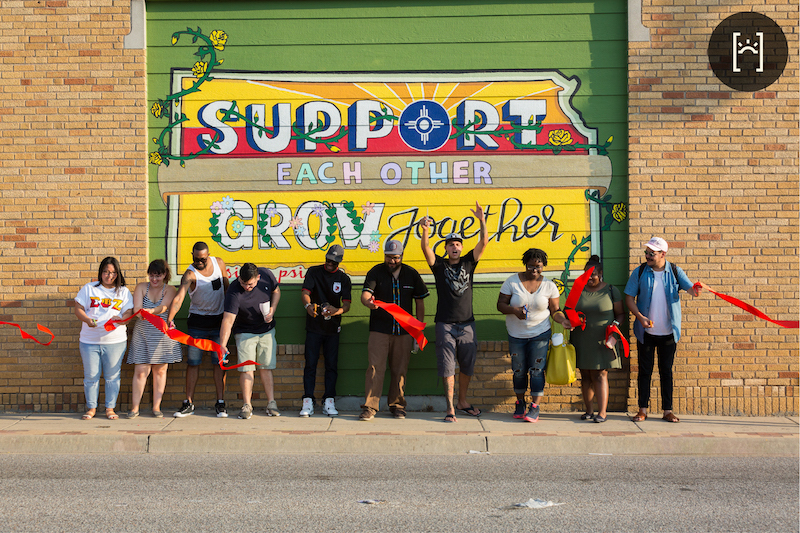 Artists and community members cut the ribbon on a mural painted at 130 E 21st Street. 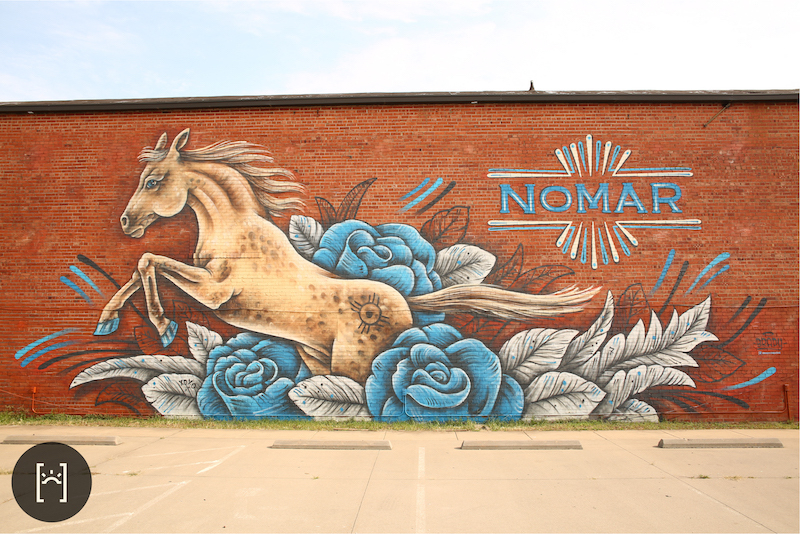 A mural on Nomar Theater, created by Kansas-based artist Brady Scott. 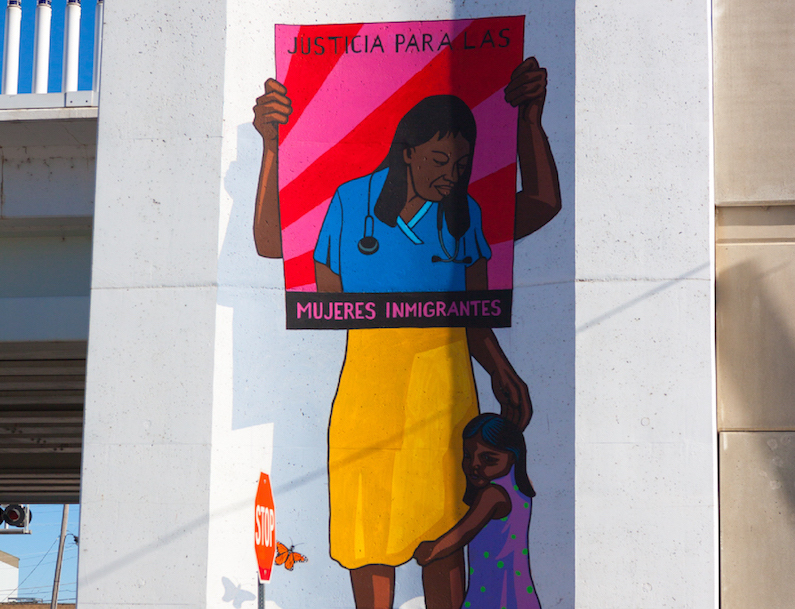 A mural at 130 E 21st Street, painted by Wichita-based artist Bernardo Trevizo, Jr., whose family immigrated from Chihuahua, Mexico. A mural at 130 E 21st Street, painted by Mexican-American artist X3MEX, who was born in Torreon, Coahuila, Mexico, and is now based in Arkansas. His murals can be found across the United States and Mexico. 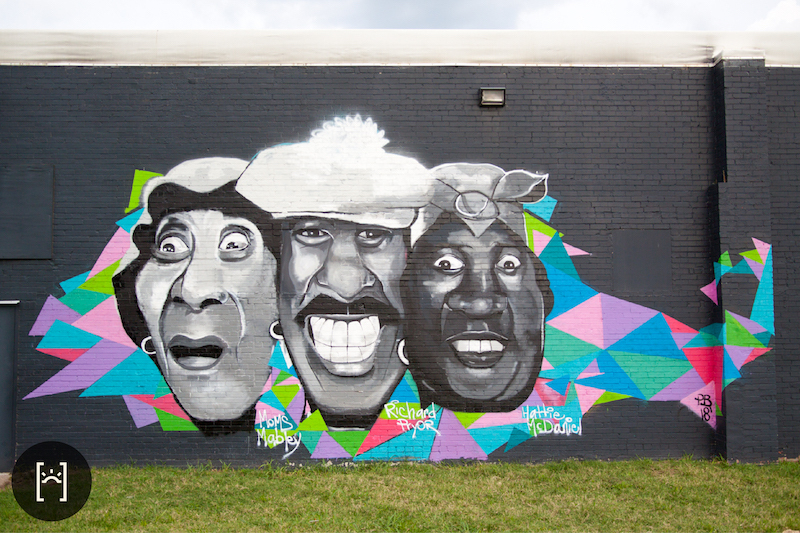 A mural on the Historic Dunbar Theatre depicts well-known African-American comedians. 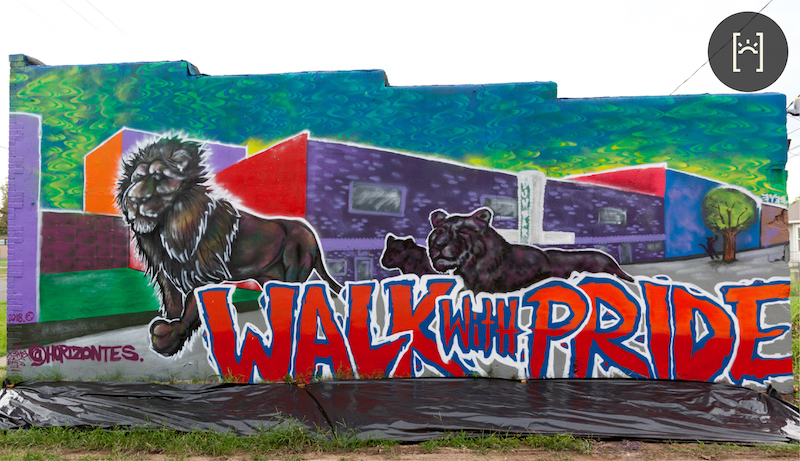 The mural was painted by graphic designer and visual urban artist Priscella Brown. A mural at 1412 E 9th Street, painted by Mexican-American artist X3MEX. 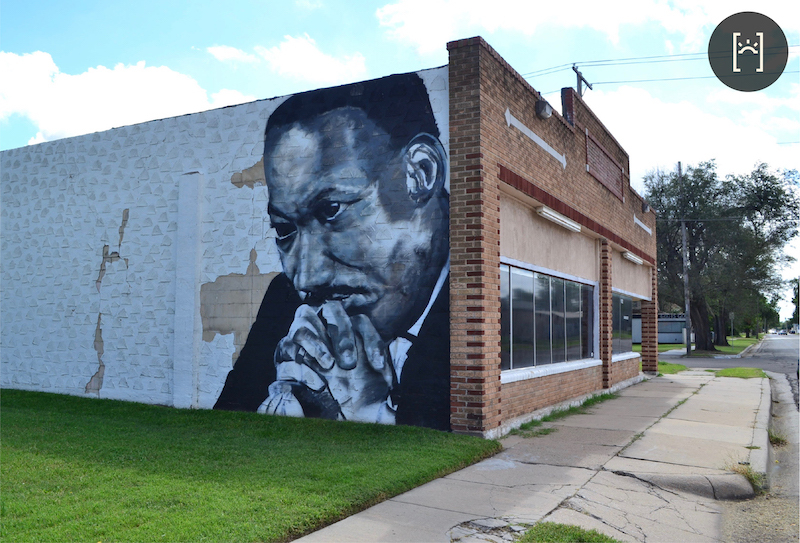 A mural of Dr. Martin Luther King, Jr. at the Historic Dunbar Theatre, painted by Daniel Guatimea. Murals at the 13th Street train bridge. Horizontes isn’t just meant to reflect the disenfranchised people of north Wichita. It is also meant to celebrate them — to give them pride in their past and present and hope for their future in America. "We have done great things as far as people of color, women, queer people — we have done great things throughout history," Minjarez says. "But, often those things are not celebrated. Some don’t even make it into history books. So it’s not that we are just now starting to do great things. We have been doing great things, and this is a way to vindicate ourselves in that. We are capable of greatness, and we have this to show for that." Once Horizontes is completed, the community engagement work, including photography and video of some of the residents in north Wichita, will be shown in the Kansas African-American Museum. The project will also host a block party, inviting the broader Wichita community into the neighborhood to celebrate new hope with the people who live there. "I think it’s a spark — and it was intended to be a spark," Neal says. "Now, in our generation, hopefully we can see some things come to fruition to make us look back and say, ‘OK, this is great. 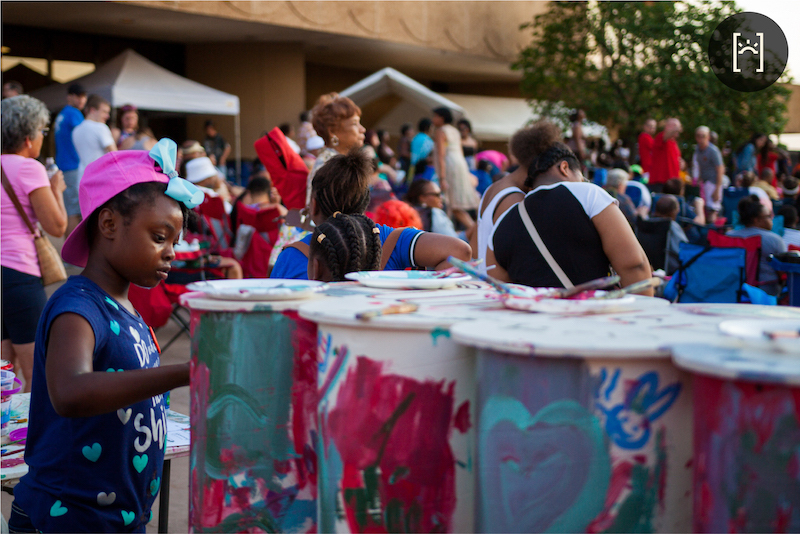 I was validated in my fight.’"
Wichitans learned more about the Horizontes project through a painting party hosted at Riverfest in 2018. 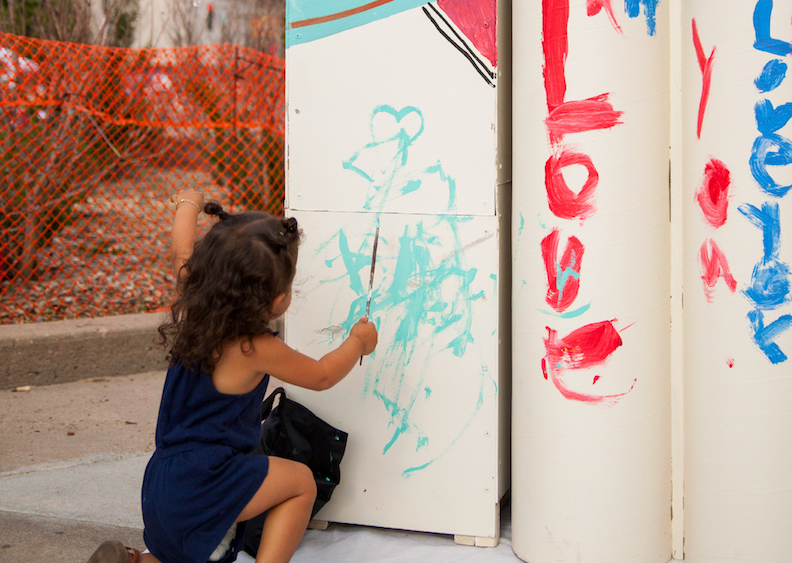 People were asked to give input and were given the opportunity to paint their own ideas on a miniature grain silo. 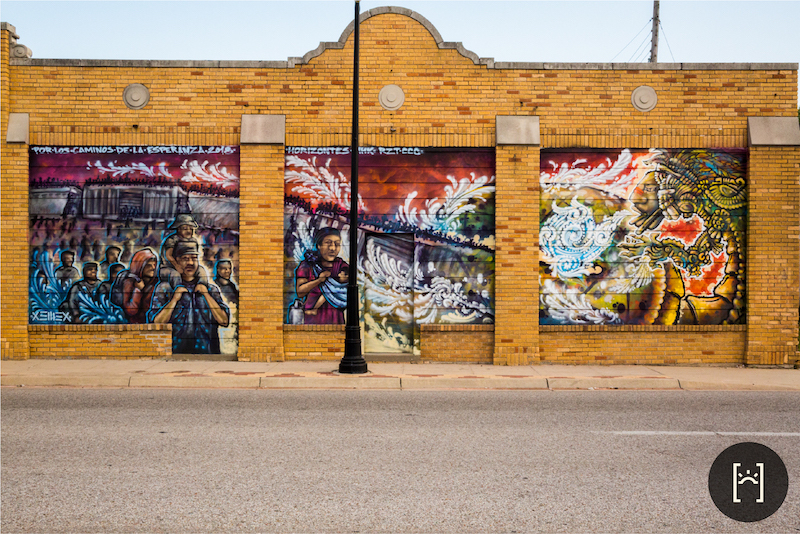 The Horizontes project seeks to connect the largely Latino and African-American neighborhoods of north Wichita through art projects across both districts. 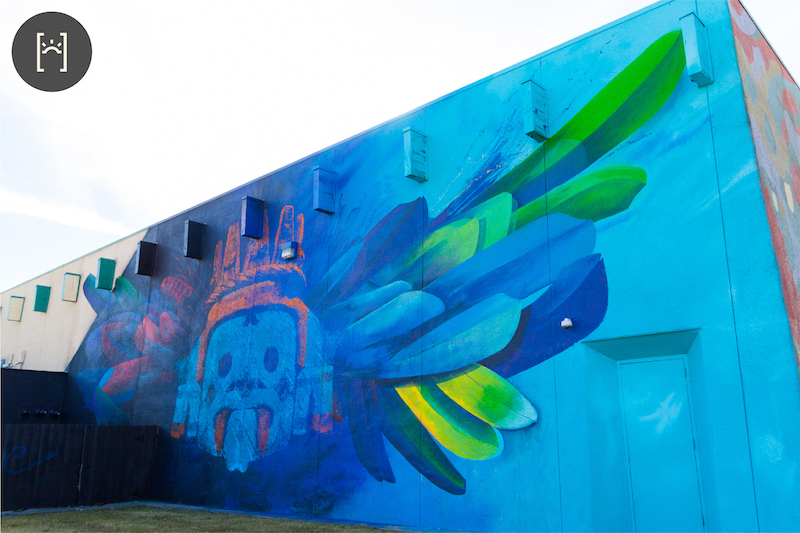 Horizontes is not limited to the murals it creates or even the stories it shares. It’s about what the people of Wichita see in the distance — in their horizon or their future. It’s about giving hope to every person who lives in Wichita, regardless of their background, neighborhood or skin color. This is a vital part of our Human Capital Challenge. If people don’t feel welcome here — or that they have a valid future here — they’ll leave. And if they leave, Wichita continues its current trajectory, which isn’t the direction we need to go. 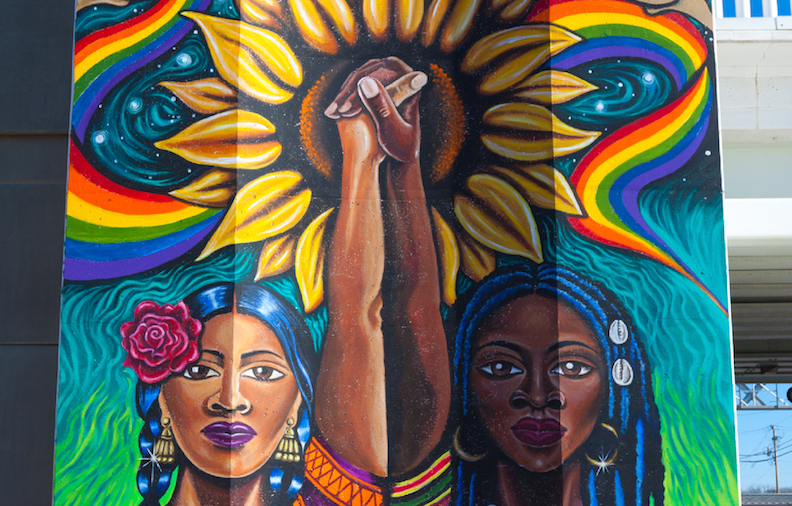 Please take some time to share the work of Horizontes in your social circles and visit the Horizontes Exhibition when it comes to the Kansas African-American Museum on January 25. Thoughts, suggestions or comments? Check us out on social media or send us a message.